As part of a continuing series, I am creating step-by-step instructions for building structures in minecraft. 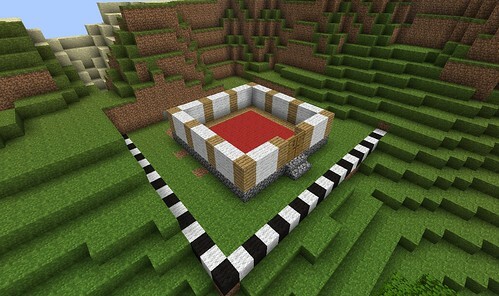 Bosch recently posted a build of a Dojo, which he soon after said he lost when his minecraft saves were corrupted/deleted. 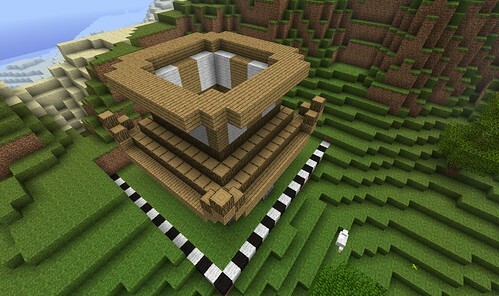 It was a very nice design, and fortunately he has enough images posted to recreate the structure. 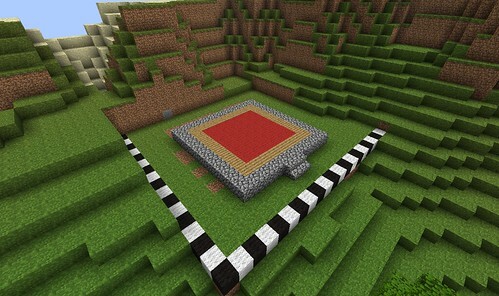 Cobble foundation, cobble steps in front of where the doors will sit, and red wool carpet. Plank forms the structure, with white wool wall panels. First roof level. 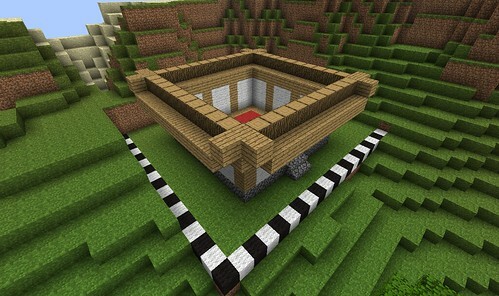 This build will leave the interior empty until after the structure is finished. Log and plank used to continue the first roof. Log and plank continued. 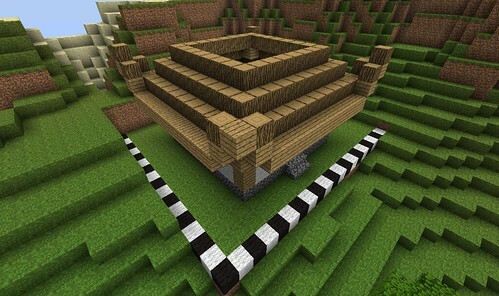 You can see how plank and log are used to form the up-turned edges of the roof. The foreground corner is left uncompleted now to allow unobstructed view of the back of the structure. Now all corners are complete. The next layer of plank and wool is added on top of the innermost layer of log from the previous step. Another ring of plank for the upper roof. Again, the foreground corner is not completed to allow easy view of the background. 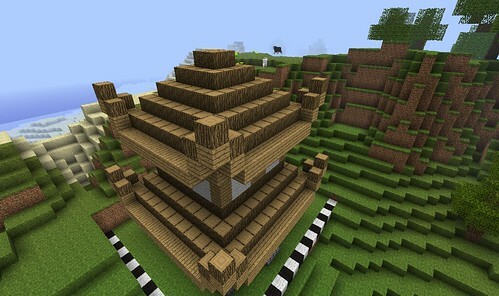 The completed log roof and up-turned corders on the upper roof. The view of the completed build from the "front lawn"
A view of the upper roof from directly above the build. Bosch did a great job furnishing the Dojo. You should check out his thread for images of how to decorate. The "Living Room" is the main floor with the doors. The "Bedroom" is the upper level room. 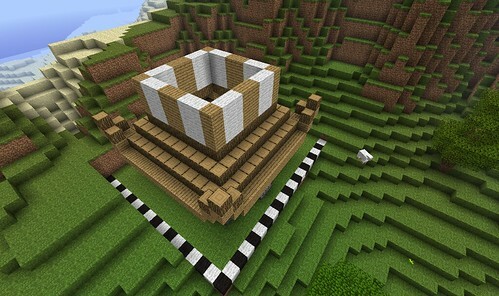 The room of chests is in the upper roof. 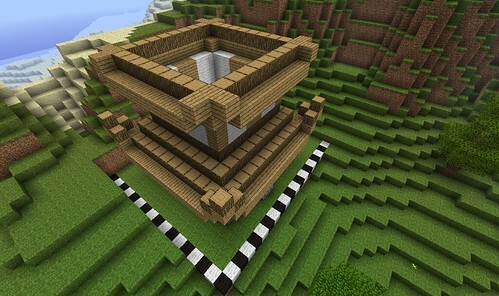 In the next post in this thread, I'll demonstrate a shingle technique, and show how to lay the floors to achieve 4 floors for this build. Former admin for the one and only VoxelBox, still looking for where I put that chest, forever punching wood. 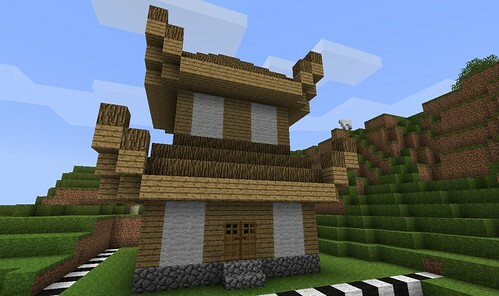 Half-height cobble stacked atop the log give the appearance of stone shingles. 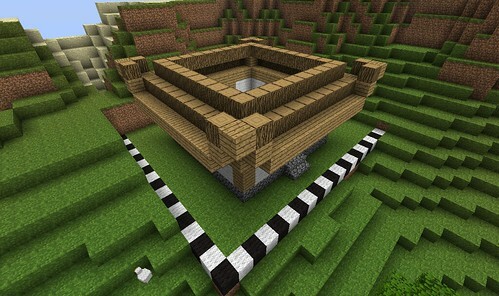 The top 4 log removed and a ruler of black and white wool added to the interior. 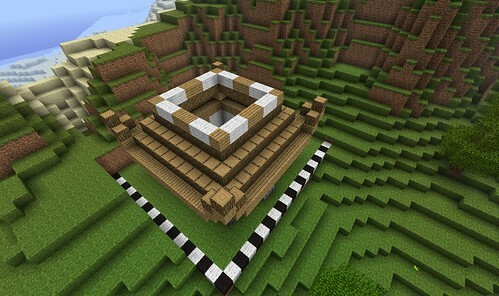 Floors will be added starting at the top of the build and working down. 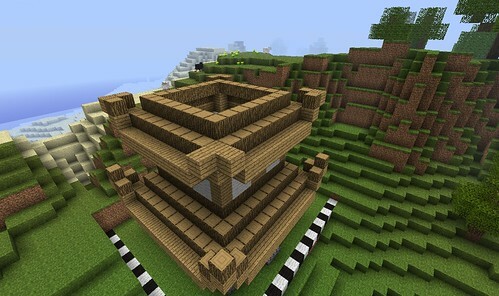 The top floor sits atop the wool panels on the upper section. 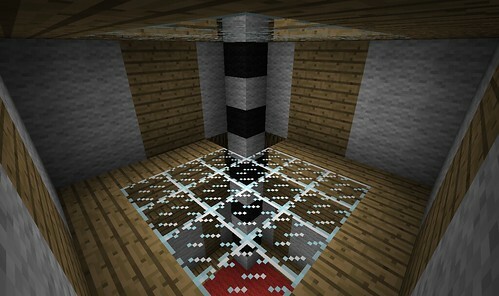 When complete, remove the ruler and replace with ladders to traverse the floors easily. 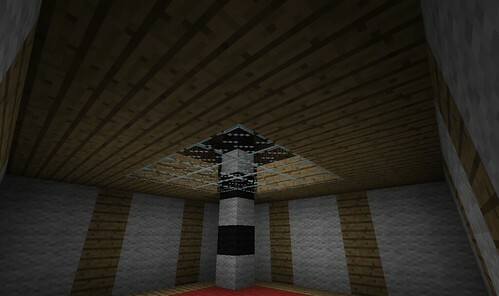 Glass is used to allow illumination of the subsequent floors. 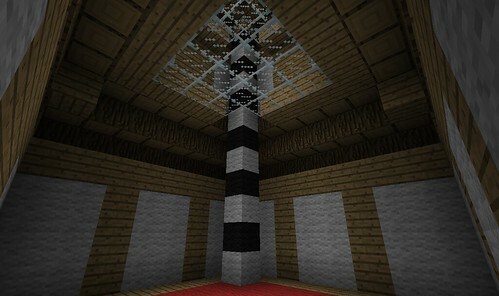 In the completed build, plank can be used in place of glass with interior light provided by glowstone or torches. Below the top-most floor, looking at the upper section wool panels. 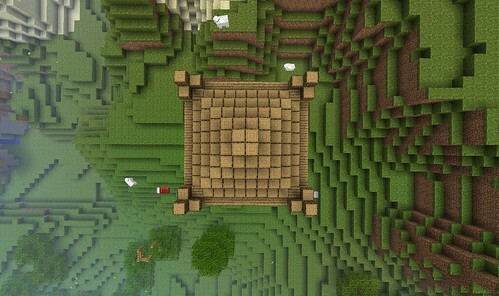 Floor added adjacent to the logs which the upper section wool panels sit atop. 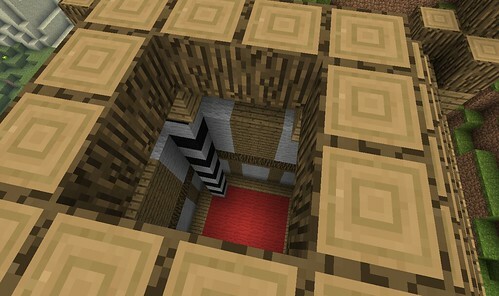 Standing on the red wool bottom floor looking up, the closest glass is from the previous step. The last floor to be added will be flush with the plank layer which sits atop the bottom section white wool panels seen at the bottom of this image. Plank floor added as described in previous step. Awshum. Can u try a sky scraper next time? I believe the name you guys were looking for is pagoda. Buildings with multiple towers and eaves are called pagodas. Dojo is just a term for a place meant for formal training. 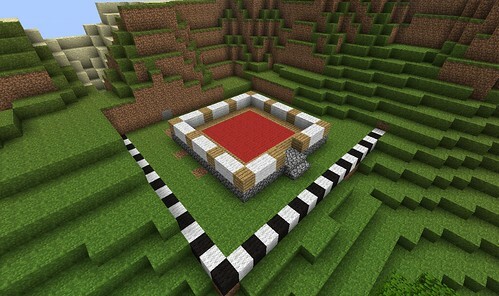 Check out my creations for my adventure map! That's why the server on which I play does daily backups of the save file. 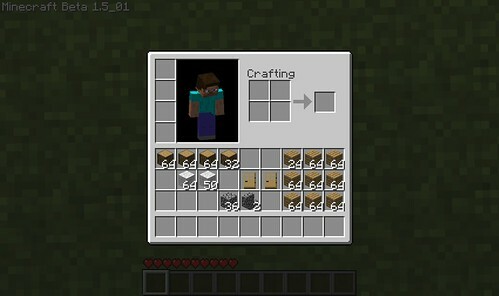 Also, whenever I complete something, I make a backup myself with WorldEdit and the schematic saver. 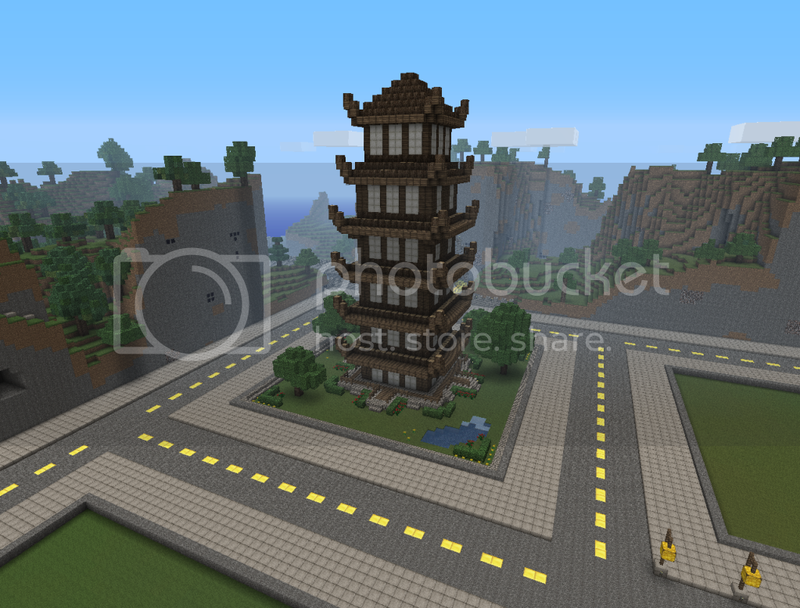 I built a pagoda-esque building in the city I'm building. It's not quite right, though - it's more just a tall building with large outdoor platforms for each floor, with each floor also getting slightly smaller each time. I may give it the "upturned corners" eventually, but that'll depend on a lot. 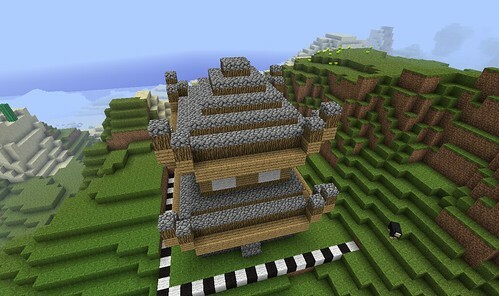 For now, however, I think I may make a second pagoda in the city with a design roughly based on yours. 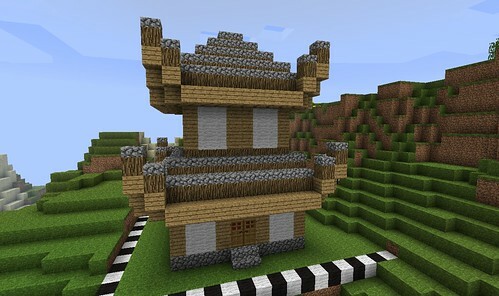 Here's my pagoda based off of this. It has a much wider base, many more floors, and a wider roof for the lower floors (tapering off to the top). Inside, it has a single wooden pillar all the way up the middle, with no connections to it the entire way down, like in many historic Japanese pagodas. can we have dimentions by chance? i cant tell at the start how many wide and long it is. Hello There! hey you called me a brony? (how did he/she know? I like to part rock! MWHAHAHA!!! When you dig up a post that's a year old like this, there's no way the OP is going to notice and answer you. And you're doing is cluttering up the forum with old dead stuff. 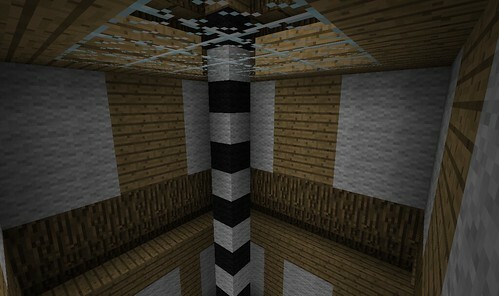 in mine I like to use jungle planks and steps for eaves.